I can identify the parts of an angle and define what an angle is. In this video, students will learn about angles measured in degrees and their relationship to a circle. This video relates to Common Core Standard 4.MD.5. A circle measures 360°. If the circle were divided into 4 equal parts, what would be the angle measurement of each part? Explain how you know. Matthew and Nick were investigating angles and circles, drawing circles and creating angles inside of their circles. Matthew drew a small circle and divided it into six equal sections. He measured the angles of each section and found that they were all 60º. Nick decided to draw a circle that was larger than Matthew’s circle. He divided his circle into six equal sections and measured the angles of each section. He expected them to be larger than 60º, but they all measured 60º. The resource sheet Circles and Angles shows the work that Matthew and Nick did. Why might Nick have thought the sections of his circle would have a larger angle measurement than the sections in Matthew’s circle? 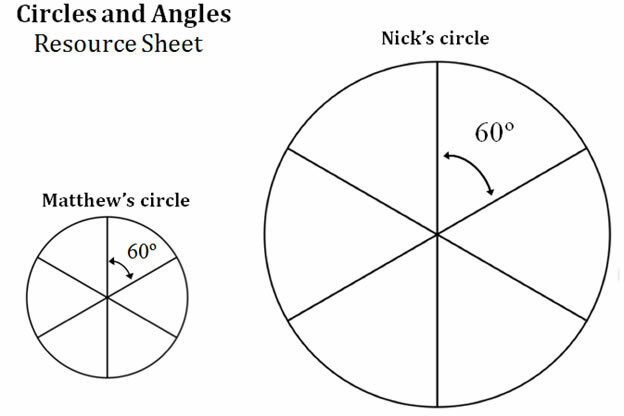 Why do the sections in Nick’s circle and the sections in Matthew’s circle have the same angle measurement?